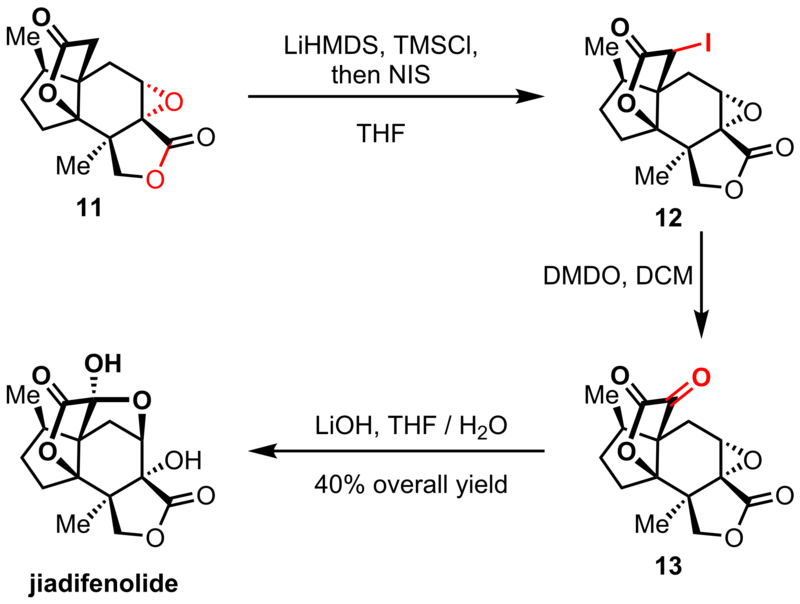 In a recent communication the Sorensen group disclosed a short synthesis of Jiadifenolide isolated by the Fukuyama group in 2009. 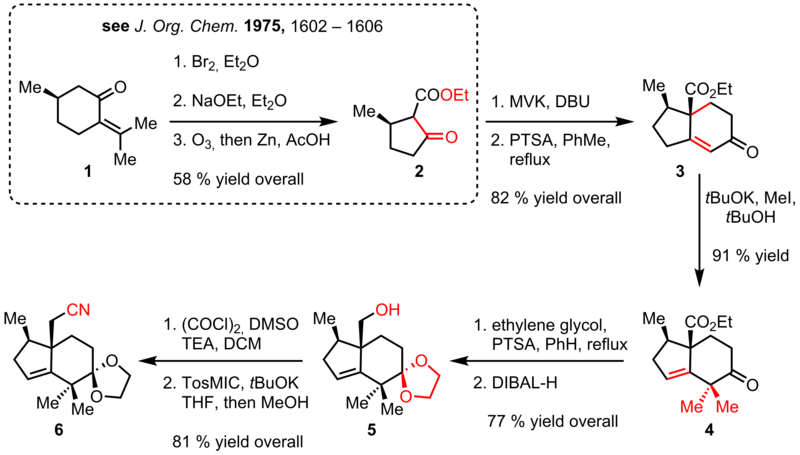 Only one synthesis has been reported to date from the Theodorakis group. The latest disclosure comprises just one major scheme proving the efficiency of this approach. 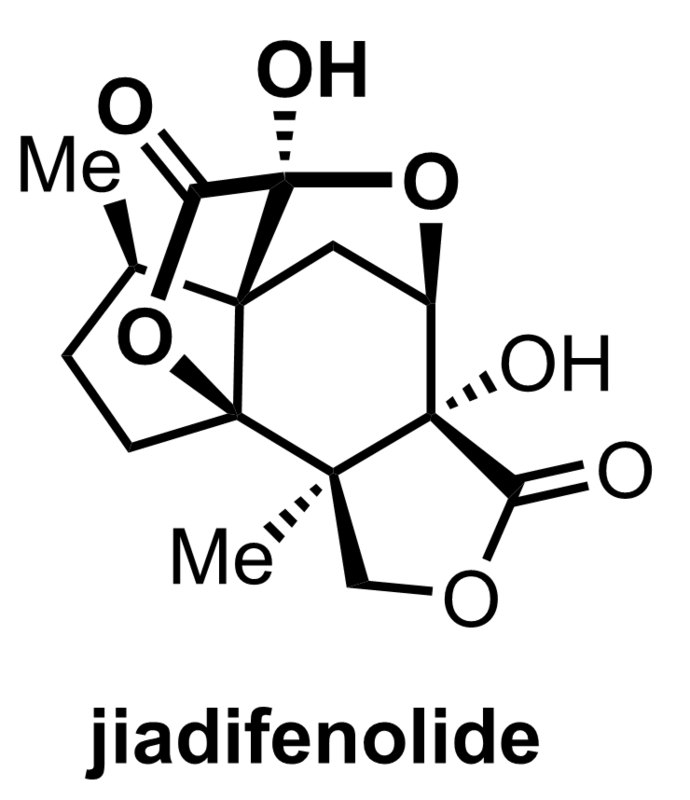 As a last introductory remark it should be noted that Jiadifenolide exhibits some promising neurotrophic activity potentiating neurite outgrowth in rats. 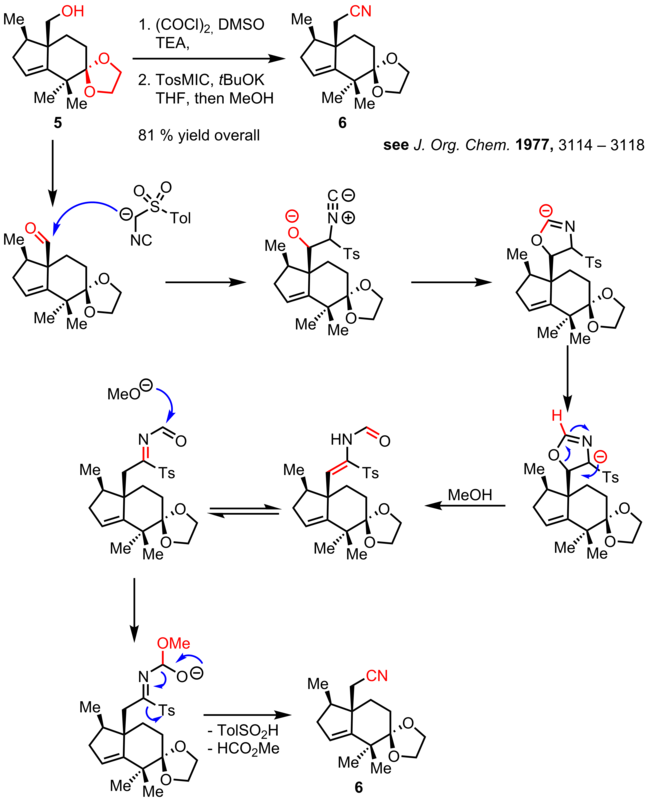 As can be found in an older JOC paper pulegone 1 can be converted into ketone 2 in three steps consisting of bromination, Favorskii rearrangement and subsequent ozonolysis. 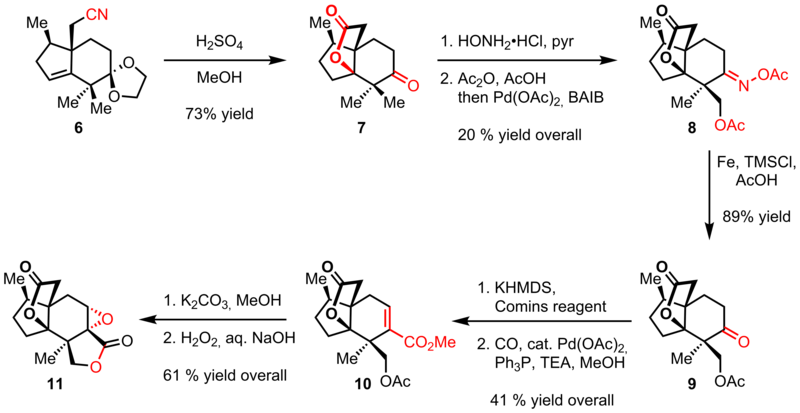 A two-step Robinson annulation then provided Hajos-Parrish ketone 3 in good yield. One-pot double methylation of the a-position of the ketone furnished 4 with the olefin shifted into the five-membered ring. Protection of the ketone with ethylene glycol and DIBAL reduction to alcohol 5 set the stage for an interesting one-carbon homologation to nitrile 6. A mechanistic rationale will be discussed later. With this nitrile in hand an intramolecular Ritter reaction was utilized to produce tricyclic lactone 7. Condensation with hydroxylamine set the stage for a directed C-H oxidation developed by the Sanford group functionalizing selectively only one of the neighboring methyl groups. Although in low yield this transformation allowed a straightforward access to the core structure of Jiadifenolide. Reductive cleavage of the oxime to ketone 9 was followed by vinyl triflate formation and methoxycarbonylation to ester 10. Lactone formation and Scheffer-Weitz epoxidation then provided epoxide 11. To conclude α-halogenation was directly followed by an interesting DMDO mediated oxidation and hydrolysis of the epoxide to finally yield Jiadifenolide in moderate yield over 3 steps. A mechanistic proposal can be found in the JOC paper cited below. After oxidation to the aldehyde the carbonyl is attacked by TosMIC to form an oxazoline ring. This undergoes an inter- or intramolecular proton shift giving rise to the stabilized oxazoline with the negative charge located next to the tosylgroup. Ring opening then forms an intermediate vinyl formamide which presumably is attacked by methanol to furnish after elimination of methylformate and tolylsulfinic acid the desired nitrile in fairly good yield. The problem set will be provided within this week and will also discuss the recent total synthesis from Paterson et al.